I wanted to share with you a few of the new Drugstore summer Collection items I picked up in case you were interested in snagging up a couple things. Unfortunately, they didn't have everything I wanted to check out however, they still did had the main 3 things I was interested in so I was excited about that! I believe most if not all of these products are limited edition so that's mainly why I wanted to share with you guys so you did have a chance to see swatches, and purchase while you can. A lot of times these limited edition items depending on the stores do sell out fast and I find very difficult to get your hands on once their gone. Keep in mind these are only my first impressions, and swatches. I have not been able to actually wear these, but again I wanted to get this post up for those whom are thinking of purchasing. 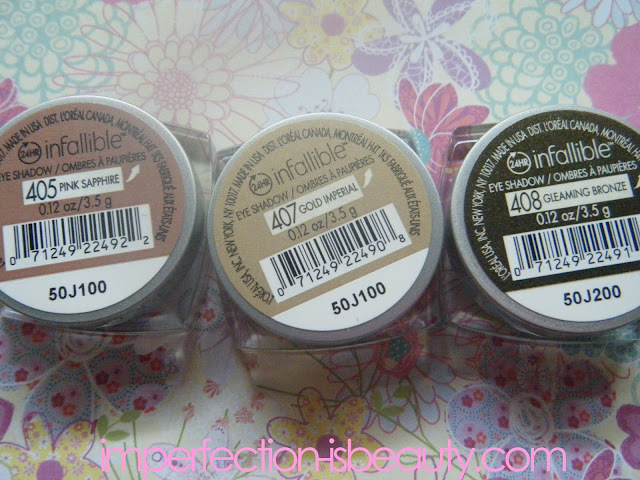 The 3 main products I was interested in were these gorgeous L'Oreal infallible 24 hour eyeshadow's. I'm pretty obsessed with the Iced Latte one that I have, so once I seen these I was immediately intrigued. 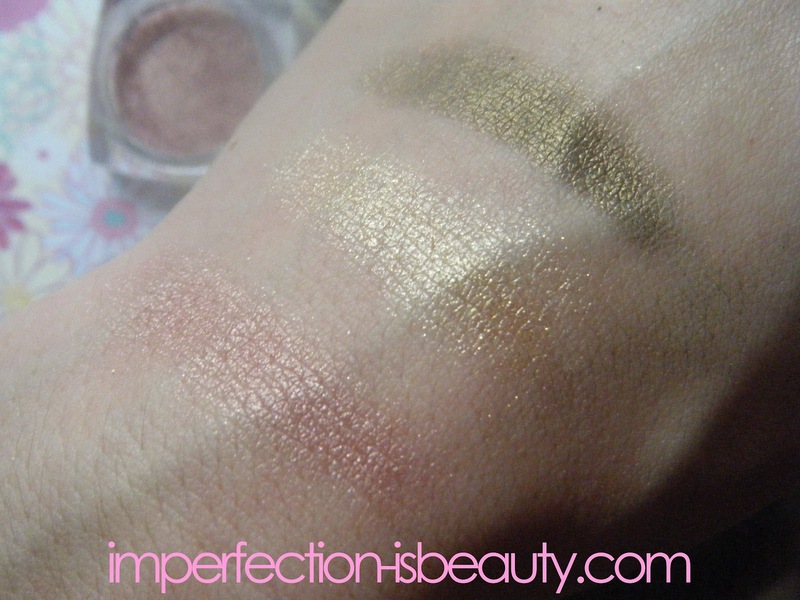 The colors are all very shimmery, and very pigmented. I could't tell you how well they blended, or the lasting power. I don't wear my makeup 24 hours so I don't know if they live up to that expectation but I can say my iced latte one I never have had a problem with wearing off throughout the day. I'm not sure but to me the formula feels different. It almost feels very velvety. I can't recall my other ones feeling that way before I started using them. The three colors I choose were. Pink Sapphire: Is a gorgeous metallic almost pulls as a rose gold shade. 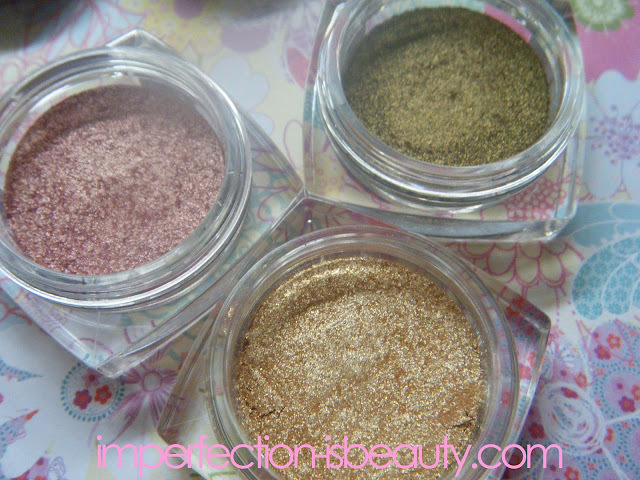 Again I barely touched these and the colors were super pigmented. Gold Imperial: This color was the one I felt I'd get the most use out of because the color is just so beautiful, and neutral and could really go with just about anything. The color to me is more of a light gold color with flakes of copper gold tones. I'm not sure if the camera picked up the copper flakes but its stunning. 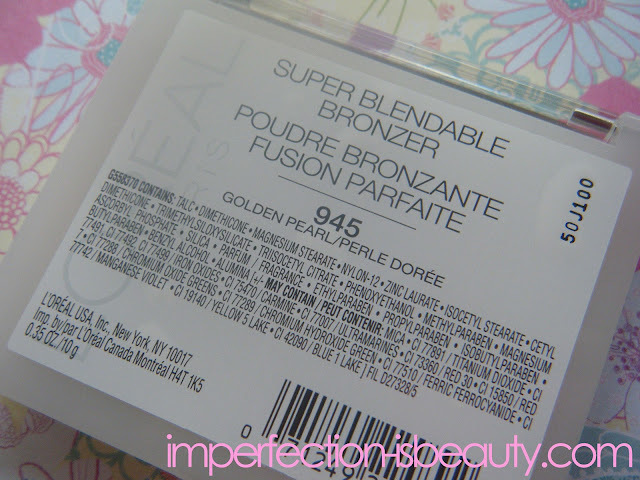 Gleaming Bronze: This almost looks like a bronzy green color to me. I feel this is my least favorite out of the three I got. Their are 4 in the new summer line. (the last one was sold out =/ ) Again considering I haven't used these I could change my mind once applied. For the price they all are pretty amazing. 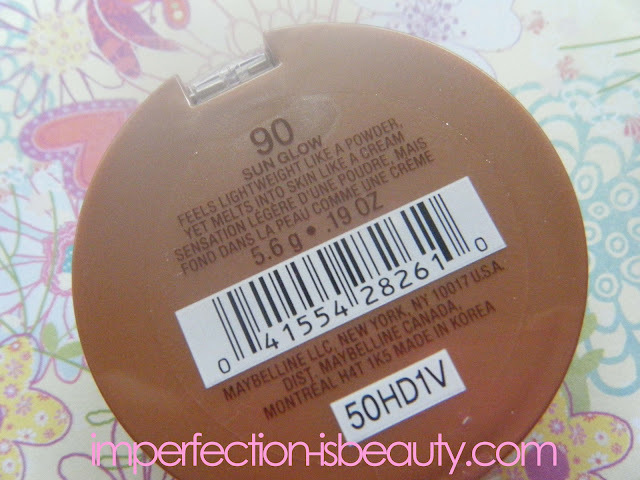 Maybelline had a few items in there summer collection. They might have had the smallest new collection out of all the new lines. 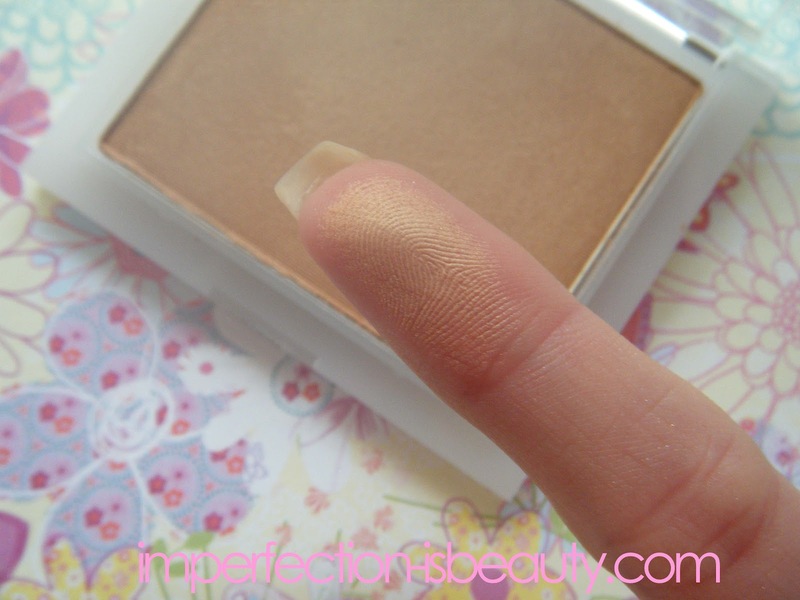 This line does have two highlighters which were completely sold out, and a few bronzers that had a ton of glitter and those I was not interested in. 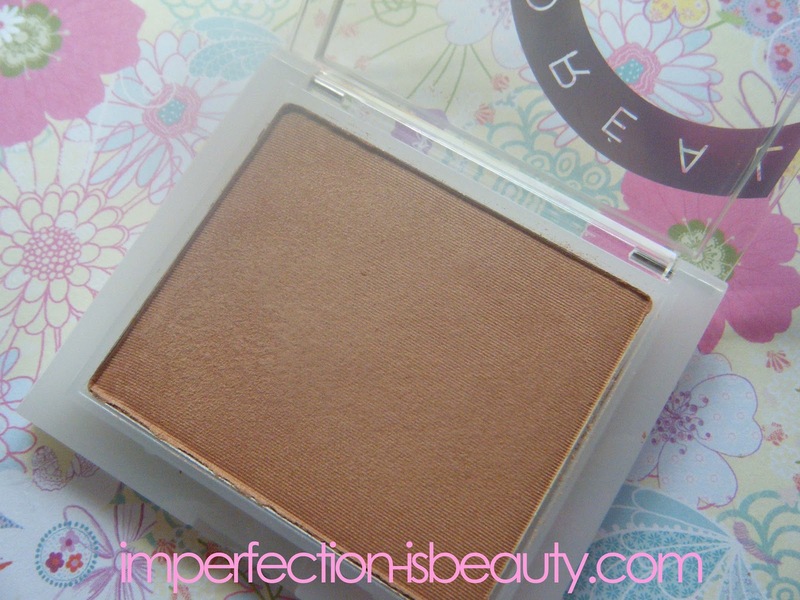 Other then this bouncy bronzer in sun glow they did have another one in a lighter shade. I actually think I should have gotten the other one because this pulls a little orange, but again will see once applied how orange it looks, and who knows that other one could still have some orange tone to it. I do have one dream bouncy blush in hot tamale, and I actually really like it so I figured I'd give this a go. 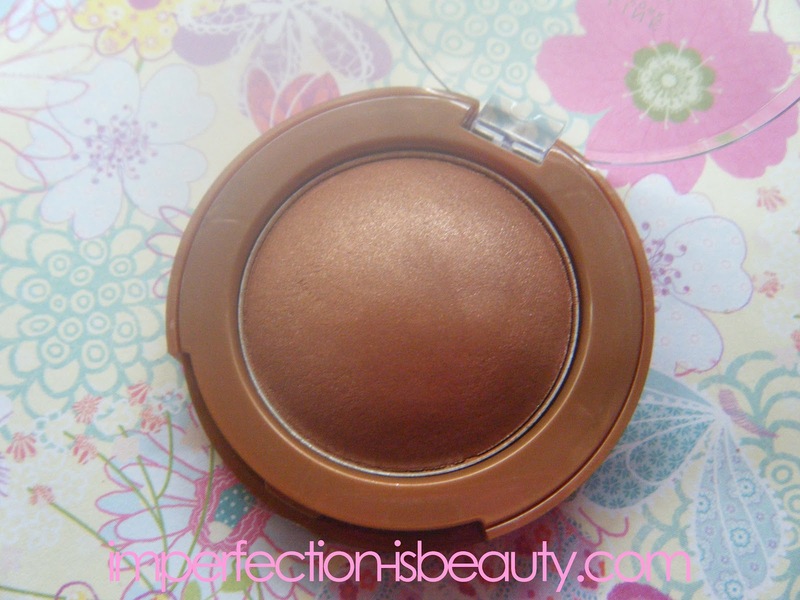 Lastly from the new collections I picked up a bronzer from L'Oreal called Golden Pearl. 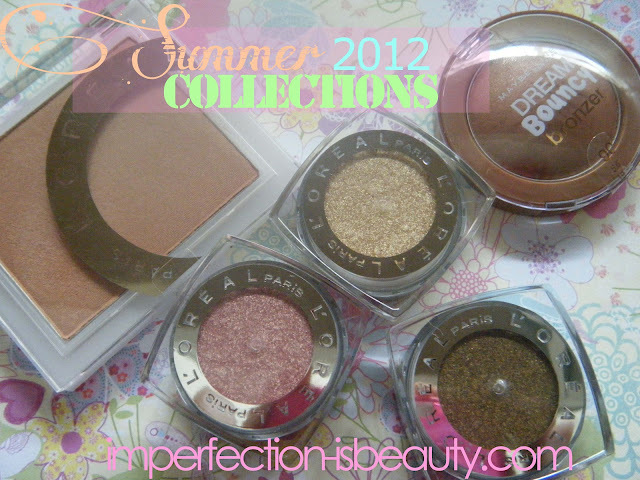 L'Oreal collection seemed the biggest to me. Their was one other bronzer that was a tad lighter, two glosses, two lipsticks, and I believe 4 nail polishes (and the four infallible eyeshadow's). 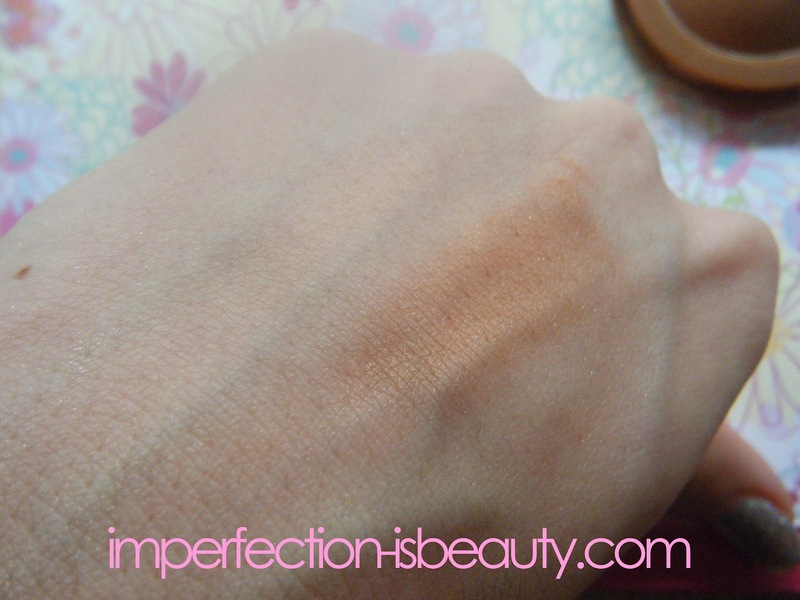 The bronzer that's clearly states on the packaging: "super blendable" was actually not easy to blend on my hand after swatched. Hopefully once I use a brush it works out. The color seemed very nice, not orange, and matte and in my case that was what I was looking for. The other blush was matte as well. Walgreen's is having buy one get one 50% off all of their Revlon, and L'Oreal products so if you are interested I would check there first! hahahha THE PINK one is my favorite!! !